Death of Fëanor (4997 F.A.) - After the death of his father, Fëanor vowed to pursue Morgoth all the way to Middle-earth and retrieve the Silmarils. He returned to Tirion (though his exile was not yet complete) and assembled a great host of Noldor. They marched north to Aqualondë, the capital of the Teleri where Fëanor tried to pursuade his kinsfolk to join the pursuit. 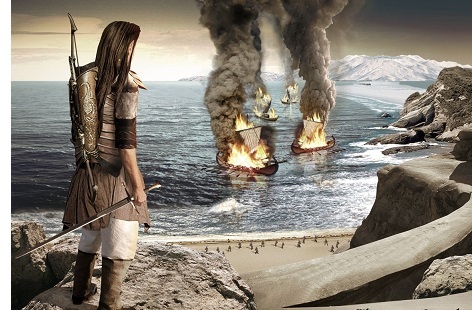 The Teleri were sailing Elves and they had ships which the Noldor needed in order to cross over into Middle-earth. But the Teleri had no interest in joining the fight, nor in leaving their home. And they also refused to give ships to the Noldor for they knew that doing so would invite the ire of the Valar who were against the Noldor. Then Fëanor grew enraged and decided to take the ships by force. What followed became known as the The Kinslaying, an event which would haunt the Noldor for ages. When they arrived in Middle-earth, they assaulted Angband in what became known as the Battle Under the Stars (Dagor-nuin-Giliath). But so eager was Fëanor to recover the Silmarils that he and a small group separated themselves from the rest of the Noldor and ran into a most fearsome foe.